You have been successfully logged out. Start building your birthday calendar by asking or adding birthdays. You only have X birthdays. Build your customized birthday calendar by asking or adding birthdays. Ask Birthdays to Friends or Add birthdays by yourself. Do you have a friend who is as beautiful as a butterfly? Do you want to tell her how special and amazing she is on her birthday? Then send her this beautiful, sparkling pink Happy Birthday card! The lights, colorful butterflies, and sweet message will bring a smile to the birthday girl's face and help her have an amazing day! Send it today! Do you have a special princess who has a birthday coming up? Then send her this sparkling Happy Birthday card! 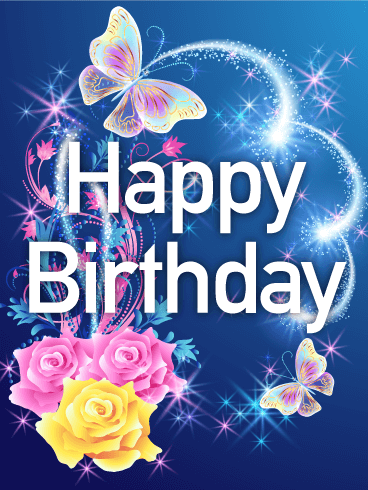 Bright, beautiful colors, glowing butterflies, delicate flowers, and glimmering sparkles make this the perfect card for your favorite birthday girl. Make this a birthday celebration fit for a queen by sending this Happy Birthday card to your best girl today! It's time for a birthday! 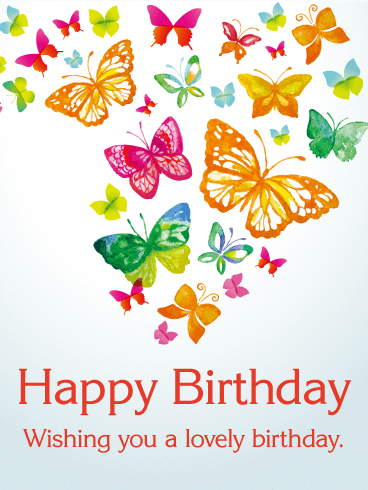 Use this fun, beautiful card to send your Happy Birthday wishes to your loved ones! 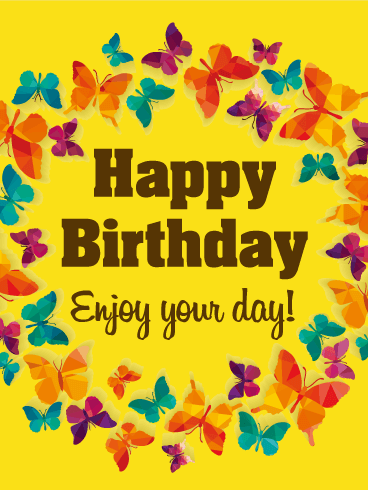 This card has a yellow background with the words "Happy Birthday - Enjoy your day!" written in brown in the center. Orange, blue, and pink butterflies surround the message in a colorful ring. Send this Happy Birthday card to the birthday girls in your life! The only thing prettier in the spring and summertime than the flowers are butterflies, free and flying. Now I've never seen butterflies in real life that look like this, and it's a safe bet that your birthday card recipient hasn't either. So, surprise her with these beauties and brighten up her day! Maybe you'll inspire her to spread her own wings and fly. Try Our 100% Free App! 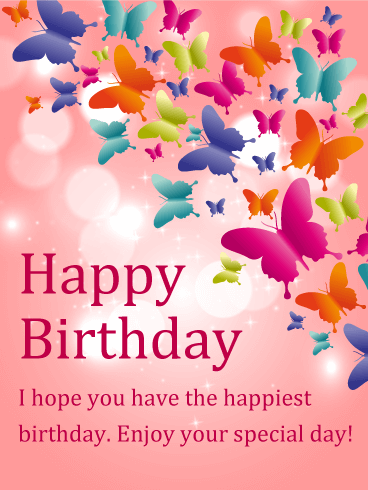 Birthday & Greeting Cards by Davia is a 100% free online greeting card (eCard) service. In addition to free eCards, Davia offers customizable birthday calendar and birthday reminders. More than 14.5 million users have joined Davia services since its inception. Sending eCards is the one of the best and easiest ways to keep in touch with friends and family. We offer a wide variety of cards, such as birthday cards, anniversary cards, Christmas cards, get well soon cards, thank you cards, and more. A greeting card has power to make someone's day even more special. The only thing you need to do is just click a few links. Send eCards via Facebook or email to make someone's day! © 2019 OKWAVE USA, Corporation. All rights reserved.